Children at the Olmoti clinic eat breakfast. Two dozen tiny hands, wielding pink and blue plastic mugs, darted in and out of a metal pot big enough to serve as a bathtub for any two of the kids gathered around it. The sides and the bottom of the pot were caked with porridge, remnants of a breakfast at Olmoti Kindergarten. These scruffy boys had devoured their share, along with 100 other children, and now were bent on enjoying a treat familiar to kids around the world – licking the bowl. It was a remarkable morning on the isolated, scrubby lands of northern Tanzania, a vast landscape where Olmoti Clinic sits visible from the kindergarten across a thorny-bush-covered rise. The youngsters in this community regularly arrived at school, their clothes raggedy and their legs and hands covered in dust, without a breakfast meal in their stomachs. Malnutrition and dehydration, exacerbated by the lack of access to running water, were not infrequent conditions at the clinic. 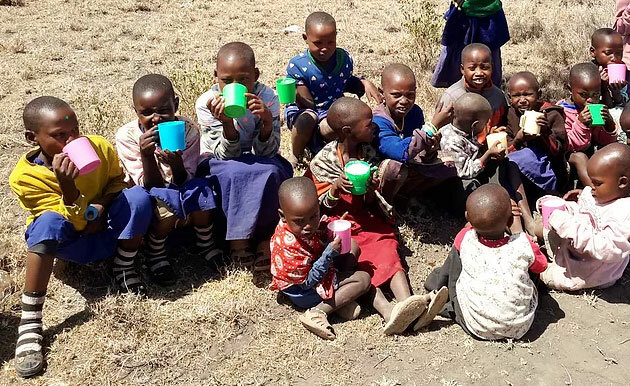 On her January 2015 trip to Tanzania, clinic co-founder Diane Raleigh decided the Olmoti Clinic could help. The presence of the kindergarten was a logical opportunity to provide the children at least some nutrition each day. Diane procured large sacks filled with more than 300 pounds of maize and sugar – the essential ingredients for porridge, along with water or milk – as well as plastic cups, two large cooking pots, a long wooden, stirring ladle and an outdoor cooking grill. The pricetag, for a daily breakfast that would change the children’s lives, was $132. On the day before the inaugural breakfast, the Olmoti Clinic, the kindergarten teacher and local midwives spread the word: there would be porridge for all in the morning. When the sun rose over Mount Kilimanjaro in the distance, however, the sweeping landscape revealed nothing of the frenzy that would soon surround the school. Only a trickle of children were on hand. By mid-morning, however, women and children began to arrive in droves, the women quickly assuming the task of mixing porridge and collecting thorny branches for a fire under the pot, while the teacher corralled the children. Inside the classroom, where the kids swarmed onto wooden benches meant to hold half their number, was a surprise: a new cotton T-shirt for each of them, courtesy of Olmoti Clinic. Soon the pot was bubbling with hot, white porridge. The kids streamed out into the sunshine to grab their new cups and descend on the take-charge mother who stood over the pot. She ladled the brew into the cups thrust toward her. The excited chatter around her quickly dissipated as all attention turned to eating. The kids settled on the dusty ground in their colorful new T-shirts. They quietly sipped the nourishment while mothers and grandmothers with babies swaddled against their backs made sure that little stragglers received a share. The scene attracted local leaders, who emerged from the brush with a white goat that contrasted with the vivid blue and red blankets cinched across their chests. “This is for you,” they told Diane. It was a gift of thanks for the grill, the ingredients, and the idea that now would become a daily morning ritual of porridge before school--the only dependable daily meal for most of the youngsters. And there was another important legacy of that day’s gathering. The names of over 100 children, more than double the normal kindergarten population, were recorded. Most were eligible for primary school but were not attending. Village leaders pledged to follow up and make sure those kids enrolled. At the end of the day, out behind the schoolhouse, a clutch of little boys scraped the pot and smacked their lips in satisfaction.